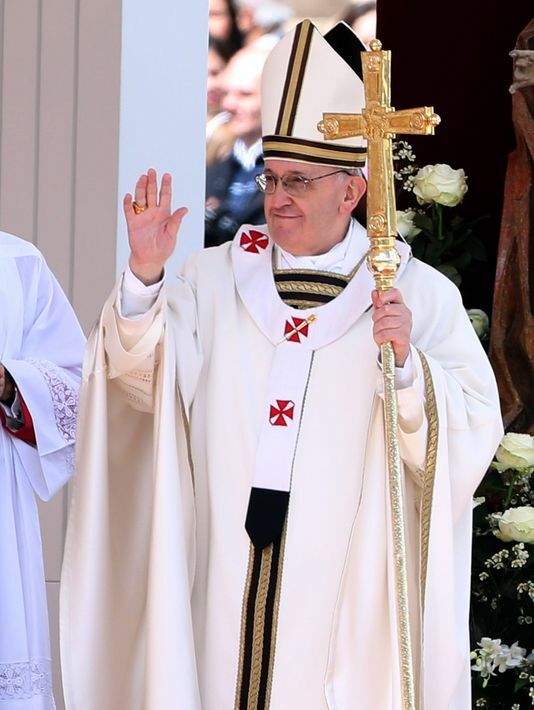 papal comparisons – who wears it best? Sometimes you don’t realize how dysfunctional and depressing a situation is until it is in the past. Only when it is over can we find the courage to look long and hard at the reality we just lived. Only when we experience the joy of new hope can we dare to admit how little hope we had. Barely one week has passed since the world was introduced to Pope Francis, and the good news stories continue to flow daily; stories of his genuine simplicity, humility, and love of the poor. Today’s headlines included the announcement that he will celebrate the Holy Thursday Mass in Rome’s Casal del Marmo prison for minors. I’m trying really hard not to be mean-spirited to his predecessor, but the comparisons are getting more and more difficult to ignore – especially in the wardrobe department. 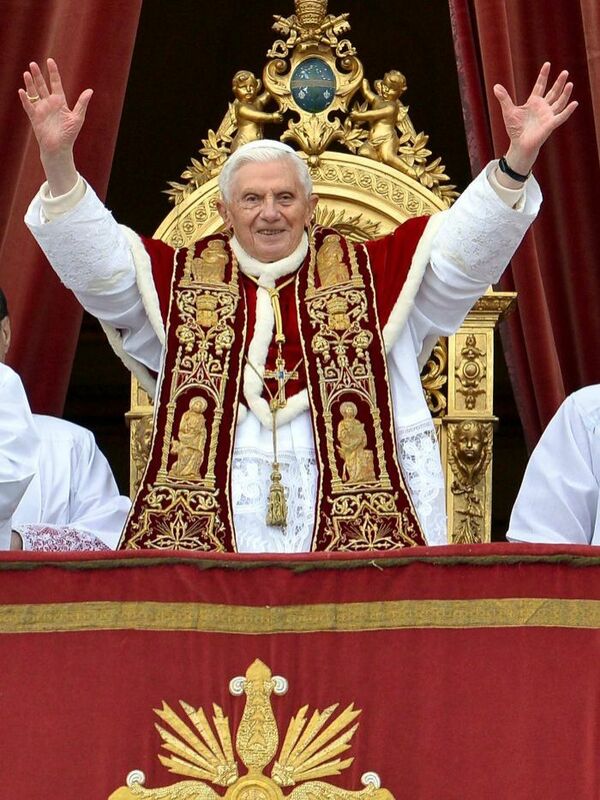 This is the first image we had of our new pope. 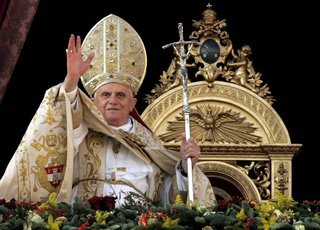 Here is Benny the Ex on the same papal balcony, giving his 2012 Christmas message. 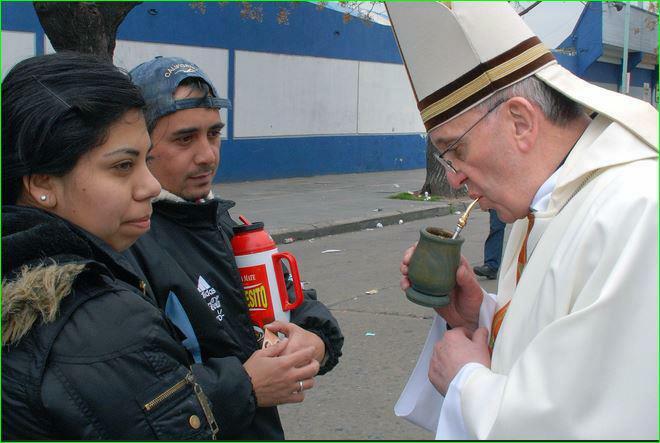 Here is Cardinal Jorge Maria Bergoglio, sharing a mate with folks on the streets of Buenos Aires. 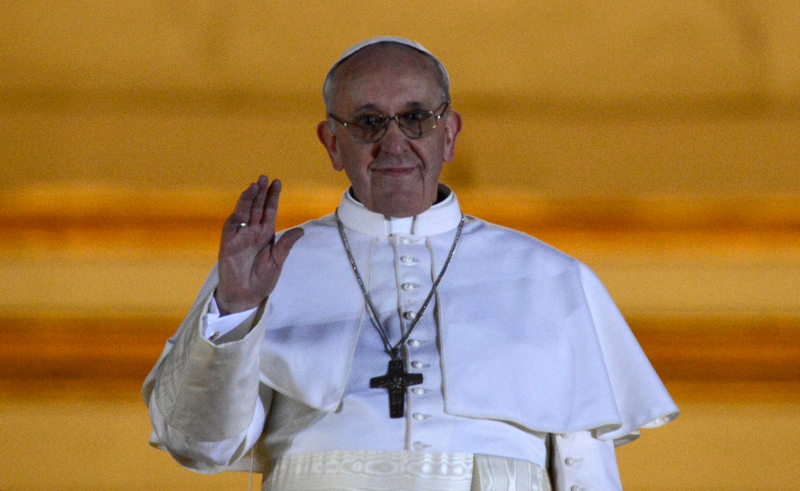 Here is our new Holy Father vested for his papal inauguration. Hmmm….the mitre looks familiar. Looks like he passed up the papal discount at Gammarelli’s. And here’s one last one of the emeritus pope. blessing each other….AND the pope! Well said, Laura….a beautifully balanced view. Isabella: Thank you. I do have a hard time seeing Christ in the spendour! How simply Jesus lived when on earth and I think was showing us the way. The best God wants from us is our loving, giving spirit to all. I agree, Kathy. As Laura said so well, it really is a paradox. I’ve been to Rome many times. When I enter the grand basilicas, there is a moment when I stand in awe of the magnificence and gob-smacking beauty….and they truly are beautiful. But, my heart always feels heavy. The grandeur seems so far removed from the simplicity of Jesus and the gospel he preached. I find your reference to our previous Pope as Benny is very disrespectful .